Engineered specifically to fit the engine bay of 2017-2018 Honda Civic Type R models, the K&N® 69-1505TWR air intake system provides a guaranteed increase in horsepower and torque (an estimated 12.6 horsepower from dynamometer testing). The 69-1505TWR system features a washable, reusable High-Flow Air Filter™, a low-restriction aluminum intake tube, and a custom steel heat shield. The unique heat shield design incorporates the vehicle’s hood in order to simulate a closed air box—keeping your engine air cooler, and giving you an increase in performance! If you want to give your Type R top-quality engine protection and a guaranteed increase in horsepower, check out the 69-1505TWR performance air intake system—specifically designed to fit in the engine bay of 2017-2018 Honda Type Rs. A low-restriction tube allows airflow to move through the system efficiently, and helps prevent turbulent air (and heat). An innovative heat shield design helps provide outstanding protection against high temperatures. Giving your engine a higher volume of cooler air an increase its combustion efficiency, which translates to greater horsepower for your vehicle! The High-Flow Air Filter™ included in the 69-1505TWR intake kit is oversized with a conical shape, providing a greater surface area and allowing for a service interval of up to 100,000 miles between cleanings (under normal highway driving conditions). High-Flow Air Filters feature an oiled, layered design—providing up to 50% more airflow than a traditional paper filter. When your filter does need to be cleaned, you can use the K&N Recharger® Kit (99-5000 or 99-5050) to quickly and easily restore your filter’s performance. Each K&N intake (and filter!) is designed to last for the life of your vehicle. 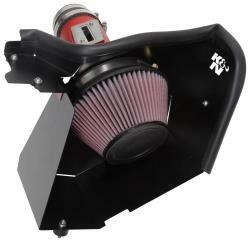 The K&N 69-1505TWR intake system is engineered to incorporate factory mounting points and the factory mass air sensor. Installation can typically be completed in 90 minutes or less, and requires only simple hand tools. Detailed instructions are included in your kit, and installation videos for many vehicles are available on the K&N website. When buying a K&N performance air intake system, you’re protected by the guarantee that you’ll gain horsepower and torque after installation! 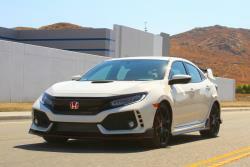 During dynamometer testing, a 2017 Honda Civic Type R with a factory air intake system was recorded at 292.4-hp at 6,122 RPM. After installation of 69-1505TWR, the same vehicle was recorded at 305.0-hp at 6,122 RPM—an estimated increase of 12.6-horsepower. The torque also increased from 254.6 lb.-ft. to 274.0 lb.-ft.—an estimated increase of 19.4 lb.-ft. at 3,731 RPM. 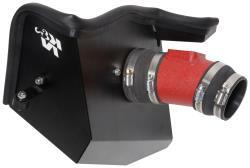 Visit this page to purchase the 69-1505TWR air intake system, or visit this link to explore other performance product options for your vehicle. Join the millions of customers who trust K&N to help them boost performance and protection in their vehicles!